Ignore the theater, focus on how they're robbing us blind. "Therefore by their fruits you will know them." At UH’s session on Tuesday, [U of H Title IX coodinator Richard]Baker referenced the scandal at Michigan State. More than 250 girls and women accused Larry Nassar, sports doctor for Michigan State and USA Gymnastics, of sexual harassment, abuse and assault. Nassar was sentenced to up to 175 years in prison in the cases. Baker, speaking Tuesday to advancement administrators, researchers and other employees, outlined how to respond if a student or colleague said they were assaulted, stalked or harassed. The in-person training session was a new requirement announced by UH President Renu Khator in February. More than 10,000 employees — from research assistants and maintenance crew members to admission recruiters and faculty — will attend the session in addition to annual online training before the end of the semester. Baker said after the session, his second of the day, that he has witnessed a shift in campus culture. He began at UH in 2011. Really?!? U of H is supposed to be some exemplar of dealing with sexual assault?!? And in their athletic department?!? When UH pulled the trigger and hired Kendal Briles as its new offensive coordinator, the football program sent out a clear message. It's willing to take a massive risk if it means winning. Briles - a former assistant under and son of Art Briles - steps into his new role with a lot of baggage and an extremely questionable reputation. And while he brings a top offensive mind and system to the Cougars, he also brings a lot of questions about the morals and ethics of the coaching staff. And it isn't because his last name is Briles. This isn't about his bloodline. It's about a coach who is named in a pending lawsuit, has broken NCAA recruiting rules and has been questionable through his actions and social media practices in the past. Kendal Briles is a controversial choice for the UH coaching staff and one they could have done without. 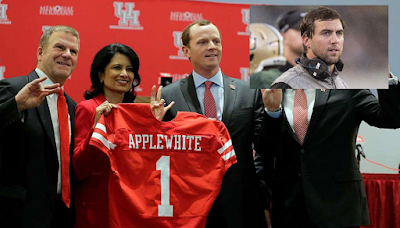 The fact that head coach Major Applewhite, new athletic director Chris Pezman, regent Tilman Fertitta and president Renu Khator all let this hire happen is worrisome. It sends out a message that winning is more important than morals when football is involved. The Baylor scandal isn't over. More information is coming. Lawsuits are still pending. More victims are coming forward. And, in case you'd forgotten, what was Kendal Briles alleged to have told a football recruit while he was at Bayor (an allegation which Briles has never attempted to refute)?!? Do you like white women? Because we have a lot of them at Baylor and they love football players. Furthermore, let's not forget that this is the same University of Houston whose initial response to open records requests from this website related to the Briles hire raised major red flags, and who have subsequently stonewalled inquiries from this website to the point where we've filed a complaint with the Attorney General's office. The stenographic nature of the Chronicle's report. At a minimum, it would seem relevant to the subject that U of H hired a coach with Briles' baggage. This only happened four months ago. One of the more perceptive criticisms we've heard of the national "hashtag Me Too" movement is that it will lead to a situation where guys who a lower on the totem pole will be subjected to highly political "training"/brainwashing; meanwhile, rich and powerful men escape consequence free. Will Dan Branch run against Ted Cruz for U.S. Senate?!? A conservative in Austin Texas with special insights into the lies you've been told your whole life!! !